Montana is a state in the Western United States. The state's name is derived from the Spanish word montaña (mountain). 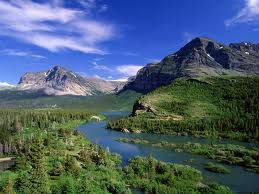 Montana has several nicknames, none official,] including "Big Sky Country" and "The Treasure State", and slogans that include "Land of the Shining Mountains" and more recently "The Last Best Place".Montana is ranked 4th in size, but 44th in population and 48th in population density of the 50 United States. The western third of Montana contains numerous mountain ranges. Smaller island ranges are found throughout the state, for a total of 77 named ranges that are part of the Rocky Mountains. The economy is primarily based on agriculture, including ranching and cereal grain farming. Other significant economic activities include oil, gas, coal and hard rock mining, lumber, and the fastest-growing sector, tourism. The health care, service, and government sectors also are significant to the state's economy. Millions of tourists annually visit Glacier National Park, the Little Bighorn Battlefield National Monument, and Yellowstone National Park. The name Montana comes from the Spanish word Montaña, meaning "mountain", or more broadly, "mountainous country". Montaña del Norte was the name given by early Spanish explorers to the entire mountainous region of the west. The name Montana was added to a bill by the United States House Committee on Territories, which was chaired at the time by Rep. James Ashley of Ohio, for the territory that would become Idaho Territory The name was successfully changed by Representatives Henry Wilson (Massachusetts) and Benjamin F. Harding (Oregon), who complained that Montana had "no meaning". When Ashley presented a bill to establish a temporary government in 1864 for a new territory to be carved out of Idaho, he again chose Montana Territory. This time Rep. Samuel Cox, also of Ohio, objected to the name. Cox complained that the name was a misnomer given that most of the territory was not mountainous and that a Native American name would be more appropriate than a Spanish one. Other names such as Shoshone were suggested, but it was eventually decided that the Committee on Territories could name it whatever they wanted, so the original name of Montana was adopted. The first gold discovered in Montana was at Gold Creek near present day Garrison in 1852. A series of major mining discoveries in the western third of the state starting in 1862 found gold, silver, copper lead, coal (and later oil) that attracted tens of thousands of miners to the area. The richest of all gold placer diggings was discovered at Alder Gulch, where the town of Virginia City was established. Other rich placer deposits were found at Last Chance Gulch, where the city of Helena now stands, Confederate Gulch, Silver Bow, Emigrant Gulch, and Cooke City. Gold output from 1862 through 1876 reached $144 million; silver then became even more important. The largest mining operations were in the city of Butte, which had important silver deposits and gigantic copper deposits. Prior to the creation of Montana Territory (1864–1889), various parts of what is now Montana were parts of Oregon Territory (1848–1859), Washington Territory (1853–1863), Idaho Territory (1863–1864), and Dakota Territory (1861–1864). Montana became a United States territory (Montana Territory) on May 26, 1864. The first territorial capital was at Bannack. The first territorial governor was Sidney Edgerton. The capital moved to Virginia City in 1865 and to Helena in 1875. In 1870, the non-Indian population of Montana Territory was 20,595. The Montana Historical Society, founded on February 2, 1865, in Virginia City is the oldest such institution west of the Mississippi (excluding Louisiana). In 1869 and 1870 respectively, the Cook–Folsom–Peterson and the Washburn–Langford–Doane Expeditions were launched from Helena into the Upper Yellowstone region and directly led to the creation of Yellowstone National Park in 1872. The first U.S. Army post established in Montana was Camp Cooke on the Missouri River in 1866 to protect steamboat traffic going to Fort Benton, Montana. More than a dozen additional military outposts were established in the state. Pressure over land ownership and control increased due to discoveries of gold in various parts of Montana and surrounding states. Major battles occurred in Montana during Red Cloud's War, the Great Sioux War of 1876, the Nez Perce War and in conflicts with Piegan Blackfeet. The most notable of these were the Marias Massacre (1870), Battle of the Little Bighorn (1876), Battle of the Big Hole (1877) and Battle of Bear Paw (1877). The last recorded conflict in Montana between the U.S. Army and Native Americans occurred in 1887 during the Battle of Crow Agency in the Big Horn country. Indian survivors who had signed treaties were generally required to move onto reservations. Approximately 66,000 people of Native American heritage live in Montana. Stemming from multiple treaties and federal legislation, including the Indian Appropriations Act (1851), the Dawes Act (1887), and the Indian Reorganization Act (1934), seven Indian reservations, encompassing eleven tribal nations, were created in Montana. A twelfth nation, the Little Shell Chippewa is a "landless" people headquartered in Great Falls, recognized by the state of Montana but not by the U.S. Government. The Blackfeet nation is headquartered on the Blackfeet Indian Reservation (1851) in Browning, Crow on the Crow Indian Reservation (1851) in Crow Agency, Confederated Salish and Kootenai and Pend d'Oreille on the Flathead Indian Reservation (1855) in Ronan, Northern Cheyenne on the Northern Cheyenne Indian Reservation (1884) at Lame Deer, Assiniboine and Gros Ventre on the Fort Belknap Indian Reservation (1888) in Fort Belknap Agency, Assiniboine and Sioux on the Fort Peck Indian Reservation (1888) at Poplar, and Chippewa-Cree on the Rocky Boy's Indian Reservation (1916) near Box Elder. Approximately 63% of all Native people live off the reservations, concentrated in the larger Montana cities with the largest concentration of urban Indians in Great Falls. The state also has a small Métis population, and 1990 census data indicated that people from as many as 275 different tribes lived in Montana. The 2010 census put Montana's population at 989,415 which is an increase of 87,220 people, or 9.7 percent, since the year 2000. Growth is mainly concentrated in Montana's seven largest counties, with the heaviest percentile growth in Gallatin County, which saw a 32 percent increase in its population since 2000. The city seeing the largest percentile growth was Kalispell with 40.1 percent, and the city with the largest actual growth was Billings with an increase in population of 14,323 since 2000. Much of the growth in both cities is explained by annexation and boundary changes, however. According to the 2010 Census, 89.4 percent of the population was White (87.8 percent Non-Hispanic White), 6.3 percent American Indian and Alaska Native, 2.9 percent Hispanics and Latinos of any race, 0.6 percent Asian, 0.4 percent Black or African American, 0.1 percent Native Hawaiian and Other Pacific Islander, 0.6 percent from Some Other Race, and 2.5 percent from two or more races.The largest European ancestry groups in Montana as of 2010 are: German (27.0 percent), Irish (14.8 percent), English (12.6 percent), and Norwegian (10.9 percent).